Lakebay is located at the head of Mayo Cove on the east side of the Key Peninsula, north of McNeil Island and west of Fox Island, near Carr Inlet, easily reached from Tacoma with a 45- minute drive via the Narrows Bridge. Lakebay waterfront real estate owners not only enjoy beautiful views from home, but easy access to one of the best kept secrets in Washington, and Penrose Point State Park, with its fabulous beaches on Puget Sound and scenic wooded hiking trails with jaw-dropping views of Mount Rainier. While you may be able to hop right into the water from your own property, Lakebay Marina is hosted here as well as is an especially happening place during the warmer months, offering both long- and short-term secure moorage, paddleboard rentals, a store and even a resort with a fully-stocked cocktail bar. 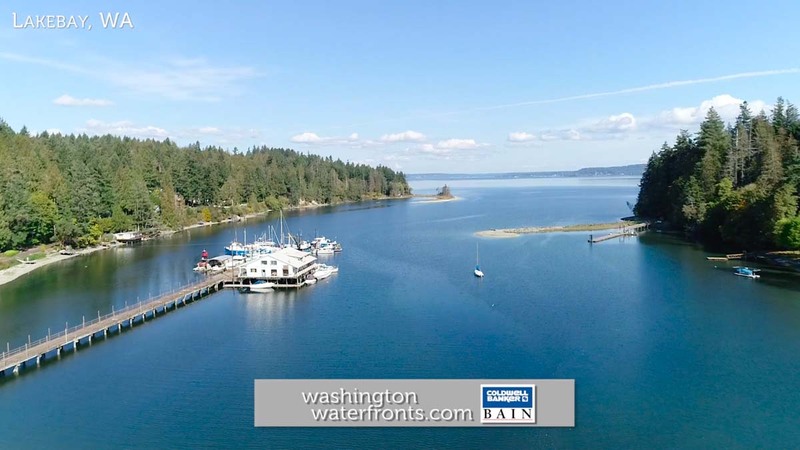 Owning Lakebay waterfront property offers the chance to fully enjoy all sorts activities at home and nearby, including on the lake the town was named for, Bay Lake, as well as on the Sound and on land. Look forward to watching for wildlife, including seals that enjoy basking in the sun and whales that swim by, fishing, golfing and hiking the miles of trails that can be found throughout the area. Of course, with so many waterways and bodies of water, Lakebay is especially ideal for boating enthusiasts. When looking for the perfect Lakebay waterfront real estate, you’ll find that many of the homes have their own docks, and some were even built on piers directly over the water, resulting in some diverse and particularly unique options. Some waterfront homes can be found nestled on the shores of a tranquil lake, with acres of privacy surrounded by lush forest, meadows and wetlands. You may even find your ideal retreat has an outdoor hot tub where you can truly soak up all of those views, watching eagles soar above while letting the cares of the day quietly fade away. Take advantage of our industry-leading tools to make your property search as easy as possible and be sure to register for a FREE account so that you can receive email alerts whenever new Lakebay waterfront real estate for sale hits the market. If you're seeking to sell your Lakebay waterfront property, contact our Waterfront Specialists directly for a comprehensive listing analysis and to learn more about the cutting-edge marketing strategies we'll use to sell your home quickly for top dollar!